Jitet Koestana Winner of First Prize "Our Heritage Jerusalem" 1st International Cartoon Contest, Istanbul, Turkey. GOLDPENCIL.ID- Semarang Cartoonist and founder of Gold Pencil Indonesia, Jitet Koestana won an international cartoon contest in Turkey. Jitet won the "First Prize" award at "1st Heritage International Cartoon Contest". The competition was attended by 232 participants from 39 countries with 642 works. "Alhamdulillah, my cartoon was awarded In Our Heritage Jerusalem International Cartoon Contest. Thank you very much to the committee, " said Jitet from Istanbul, Turkey, Saturday (16/12/2017). The award ceremony takes place in Istanbul, Turkey, December 15, 2017. Jitet's work features the visual city of Jerusalem. The wall looks like a falling water wave. There is a building with golden dome with a bouquet of flowers. This work is titled "Save Jerusalem". Through the work, Jitet expressed his hope for the big problem that is engulfing Jerusalem. He hopes that the City of Jerusalem can be saved. "Because, Jerusalem is a place where people worship God," he said. He just want to invite, live side by side with each other. Loving each other. Because there is no religion, which teaches to hate each other and hostile. Because peace is beautiful. "God created a rainbow, not just one color, but colorful. God created the fish, not just one color, but colorful. In my opinion, it's all beautiful, "he said. 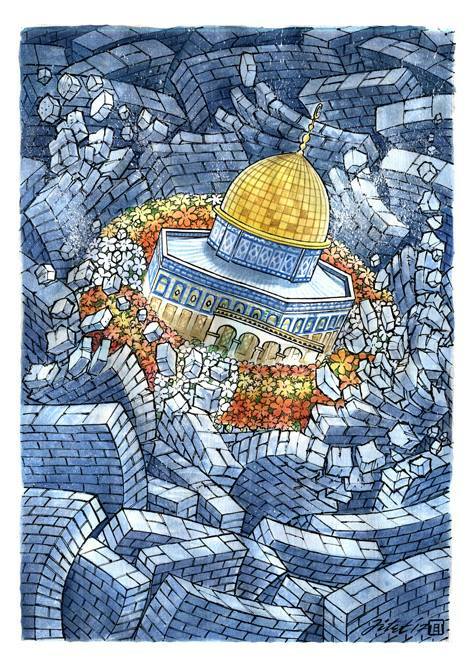 Cartoon "Save Jerusalem" by Jitet Koestana. 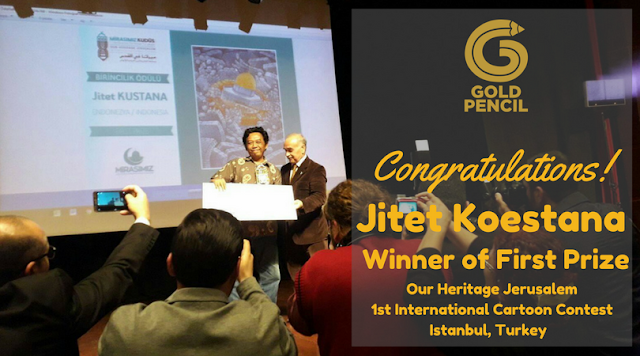 1 Response to "Jitet Koestana Winner of First Prize "Our Heritage Jerusalem" 1st International Cartoon Contest Turkey "
Wow, subhanalloh karya pak jitet keren..